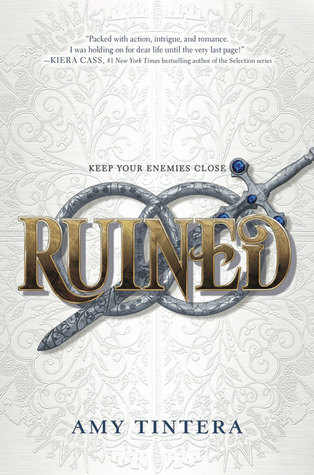 Ruined is a fun, quick fantasy romance with plenty of action, violence, and political intrigue, that only gets better as the series goes on. Ruined follows Emelina Flores, daughter of the late Queen of the Ruined, as she infiltrates the enemies palace. She takes the identity of Prince Casimir’s fiance, Princess Mary, and plots to get revenge for the death of her parents and rescue her sister. What she doesn’t expect, however, is falling for the prince. The plot is fast-paced, filled with action and adorable romance. I will admit, it is kind of your typical YA fantasy romance and some of the plot points can feel very predictable, but I feel that after the first book it manages to deviate from these tropes and cliches. Amy Tintera’s writing style keeps the pages of this series turning, and making the story quick and fun despite some of the dark concept and themes. Although, the one downside to the writing style is that when a character dies, it doesn’t feel as heart-wrenching as painful as it could because this book just keeps moving so fast that the impact wasn’t as big as it could have been. The setting was well-developed, and only gets better developed as the series continues, but I really wish this series came with a map. I found it hard to keep track of where each country was in relation to each other. However, I do feel like if you paid enough attention, you could make a clear map of the world in your head (or in real life and send it to me because I really want a map). The characters in this book are what really made me love it. They are all unique and fascinating, yet real. It allows for some of the plot twists and development to feel truly genuine and possible, instead of forced. I really adored the development of the characters in this series. The characters at the beginning of this series are very different from the characters at the end of the last book, and it makes complete sense. Their development is amazing and feels completely true to them. I loved Cas so much as a character. He was kinda idiotic at times, but he recognizes it and grows from his mistakes. I love his unending optimism and hope even when the outlook is bleak. Usually, the love interest is dark and broody but Cas is such a ray of sunshine and I love him. Em is another great character, and I really appreciate her arc in this series (that’s all I can say without spoilers sorry). Also, their relationship is completely adorable. This book has plenty of great side-characters as well, like Aren, Iria, and Galo. They all have individual stories and there’s even some LGBT rep so YAY!!!! Ruined is a great start to an amazing series with complex and developed characters, epic action, and a completely precious romance.